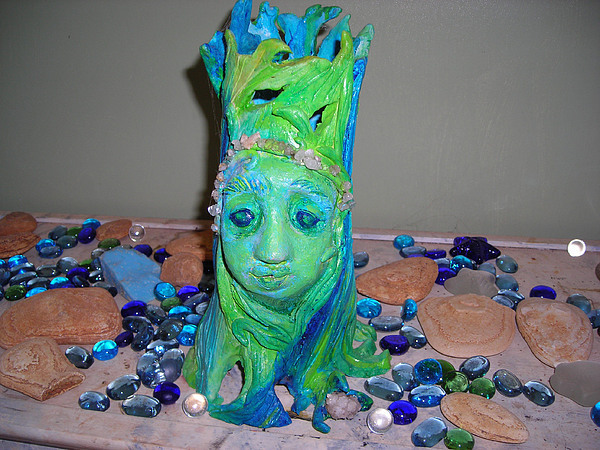 Tree Goddess is a mixed media by Diane Sellers which was uploaded on January 13th, 2010. Tree goddess,, sold to private collector through art auction at Lyric Theater, Harrison , Arkansas,, here I incorporated native crystals into the piece,,after I fired it,,,, as I do a lot of the times,, these crystals are good for the health and spirit of the individual who owns it,,it brings piece and tranquillity to the space it lives in,,candles can be burned inside this piece,,also..
all my work sells really fast so email me for next available piece,,,moongoddess7@leadhill.net.. There are no comments for Tree Goddess . Click here to post the first comment.